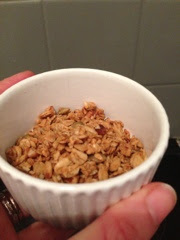 When I was sent Lizi's Granola to try I was initially struck by the packaging (I'm a sucker for that sort of thing), it made me feel indulged and the next thing to hit me was the smell as I opened the packet...good lord it smelt lovely, a rich nutty pecan smell. We have the treacle pecan variety. So far I've had it with skimmed milk, on its own and with Bubba's fromaige frais. Each time it was delish and doesn't disappoint. It's also a healthier version than most other granola on the market with slow release carbohydrates to really keep you fuller for longer. The only draw backs I can find are that Hubby and Bubba keep trying to steal it off me. Also I seem to be having cheeky small bowls at different times of the day because I just can't stop eating it...it's slightly addictive, try it yourself. 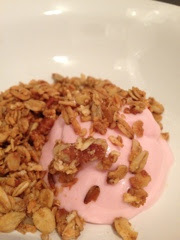 Also check out the website because it has some great recipes on how to use the granola. 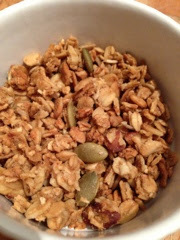 We were kindly sent the granola to try and all opinions are my own.